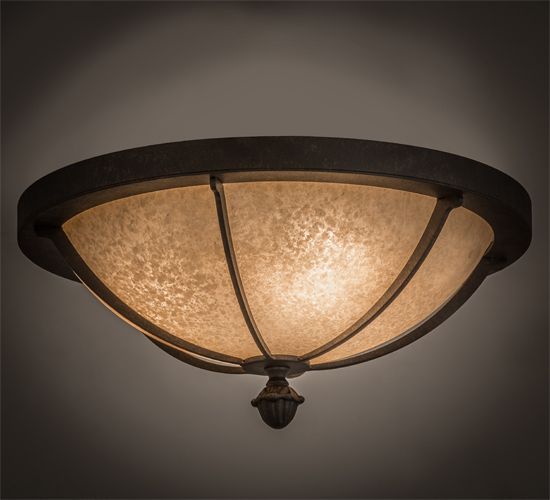 Description: Inspired by the rustic elegance of European architecture, this stunning steel ceiling fixture features a Turisomo art glass shade with a textured stippled look. The shade is enhanced with a frame, hardware and a decorative accent featured in a Chestnut finish. Dominga is ideal for hallways, living spaces and other rooms in both residential and commercial environments. The fixture is handcrafted by highly skilled artisans in our 180,000 square foot manufacturing facility in Yorkville, New York, in the USA. Options include dimmable energy efficient lamping, as well as custom sizes, styles and colors. UL and cUL listed for damp and dry locations.